Title page of Anna Magdalena Bach's manuscript of the Six Suites for Violoncello Solo without Bass. Dated before 1750, the author (Anna Magdalena Bach) is dead more than 70 years ago. So it is in the public domain. Approximately thirty-three years ago I took my first--and, as it turns out, last--college-level music appreciation class with, my friend, Kristen. The class was taught, unusually, by a professor-musician in the music department, a cellist, who presented the course in a rather free-wheeling, very personal manner, which was casual, almost facetious on the subject of coursework, homework, and testing student knowledge, but had an easy intimacy, a pleasant spontaneity, and an honest but usually frustrated curiosity about the opinions, feedback, and real-time reactions of the class to statements and comparisons he made or to the work of composers or performers he played for us on recording. I loved it. And Kristen and I found a way to not only be attentive to much of the material but crack each other up constantly. It was probably the other way around, in all honesty, and being equally honest, it was hardly the most respectful mode one could apply to a pedagogic setting, and our guide through the course material would shoot us an amused or unamused look of exasperation from time to time. What we liked about the course--the absence of any substantive demands--is what allowed us to play off each other, sometimes to the point of obnoxiousness, but it was also the dimension that allowed the course to, at its best, truly be about the appreciation of music, through knowledge of its history and evolution, theory and application, changing roster of instruments and styles, generic and musical categories, performance traditions, cultural impacts and influences, gossip and legends, and the work of its various contributors, which we were frequently invited to listen to, consider, and appreciate. Rather than take notes or study for an exam, he really wanted us to listen, not just hear; not just think but experience. One day, he brought along his cello, and proceeded to speak about and to play for us, right there, on his instrument sections from J. S. Bach's Six Suites for Unaccompanied Violoncello. First, it must be said, the experience of being in the same room with a cello as it is being played was an immediately exciting, even physical, experience, as you could actually feel the vibrations from the strings passing through your chest and torso, through your head, through your heart, through your body, as though it were a medium--because, it is--and you could feel the vibrations of these strings in your hair and on the surface of your skin and in the hairs on the surface of your skin. When our instructor first described what we were to hear--six suites, which are Baroque dances, for solo cello, played on a cello and just that one cello with nothing else--my heart sank, having cut my teeth and ears on the enormous, layered sound and drama of the Mozart Requiem and Beethoven's second symphony. This was also the first time we'd heard music that wasn't on a recording. This was *live*. It was alive, and you could not escape the fact that a person was playing this for you, in the room with you, nearby. A breathing, real person, with a pumping heart, and a body, who, before he drew his bow across the silent, waiting, taut, straining strings of his cello with an incredible delicacy, yet with a precision, a placement, and the infinitesimal specificity of muscle, of power, he took a deep breath, as though he were about to speak, or sing. Because, as I learned years later from my friend, Chase, a dancer, who would always do the same thing before she danced a phrase, that is exactly, of course, what one is doing. Of course. Everything about his playing was physical and real, breathing, and moving, and sweating, and there. And you were there.The slightest tap of the bow sent ridges or jitters or colors of sound through the room and the people in it. And one had the impression that the strings, before they were played, were already vibrating, already straining to release something out of them, into the air, into the world, through you and out into the world, because the slightest touch of the bow or finger was immediate, experiential, and thrilling. This there-ness of it all, you, and he, the cello, the sound, the feeling of the sound, the dark, varnished, warm, sonorousness of wood, both enclosing you as a reflection, as a comfort, and holding you at a certain arms length, as art can do, was indistinguishable from deep intimacy, and connection. It was like being in love and profoundly alone at the same time. Bach wrote six suites for the solo cello, each with six movements, each in the Italian style of the Baroque dance suite, except for the two movements, in the gorgeous and melancholy fifth suite, composed in the French style. Our teacher played the prelude to the first suite. It is likely you have heard that prelude in different commercials or as the underscoring in various films, and so it is likely the best known of the thirty-six movements Bach composed. I can't help feeling it to be the signature of the work, because it was my entry point to it, and because its omnipresence functions as the sign for the whole. Ask anyone if they know Bach's cello suites for solo cello and she or he will sing you the familiar, DAH-bah-dah-bah-dah-bah-dah-dee-dah, of its opening, not any of the equally or surpassingly beautiful passages from any of the rest of it. And that is okay. By rights, the sixth should count as the signature, of the composer, and the end of the sixth, especially, since the suites become more expressive, more complex, nuanced, and demanding on several of several levels, for the cellist, as they go. For the listener, it is a different story. Unencumbered by the enormous interpretive, performative, and technical demands of playing them, we are allowed the opportunity--if we choose to take it, and you must choose to take it, for, while some passages of some of the movements of some of the suites will grab you and demand your attention, others, most of them, will only reveal themselves to you if you give yourself to them--of floating and plunging or soaring through a series of sounds that are a line of sound coming from two people through one specific instrument at one specific time. There are three people actually involved, however. The first is always Johann Sebastian Bach, the composer, the second is the cellist, always, and the third, the third always is you. The prelude to the first suite ends at 2:26. You may of course listen to the entire suite, as you prefer. The suites were more or less forgotten to time and hearing, when, in the early twentieth century the great Catalan cellist, Pablo Casals, as a thirteen-year-old boy, discovered them in a thrift shop, and studied them carefully for many years until he felt he was ready to record them between 1936 and 1939. Before this time, they had always been considered studies or etudes--lessons--unsuitable for public performance. 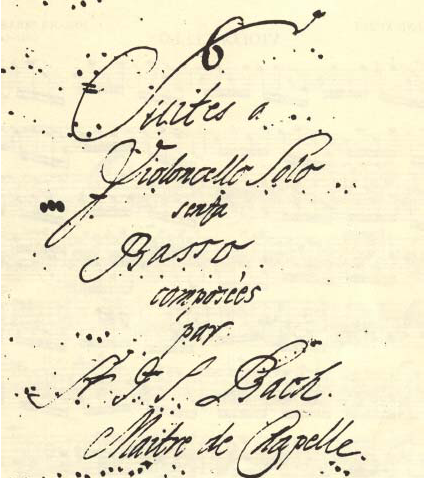 There was the added "problem" that the suites do not exist in an autograph score (in the hand of the composer), but only in the hand of his second wife, Anna Magdalena Bach, who, after Bach's death faced financial hardship, little to no help from his children of his first marriage, or her own, except for her stepson, C.P.E. Bach, and who is understood to have died penniless, homeless, on the street, buried in an unmarked, pauper's grave at Leipzig's Johanniskirche. which was destroyed by Allied bombing during World War II. Without the hand of this discarded woman, we would know nothing of a work considered to be one of the sublime expressions of humanity. Think about that for a while. Not even her unmarked grave exists. Casals recognized the quality of the Suites, and because of the quality of his name and reputation, other cellists recognized it as well, and recorded it as well. It is only in the twentieth century that these six pieces were finally given their due, six pieces for unaccompanied cello, which in 1980 the British music critic, Wilifrid Mellers, called, in a very memorable phrase, "Monophonic music wherein a man has created a dance of God." Cellists since the time of Casals have recorded them, some of them more than once, because their understanding of them has evolved over time. They are not notated in a way that gives very much direction to the performer, so fast or slow, Romantic or not, sensual, austere, dance-like or not, it is given to the interpreter to make these choices. So. When I learned that Yo Yo Ma would be playing all six suites at Blossom--the outdoor, summer, amphitheater home of the Cleveland Orchestra--I suggested to my parents, who always get a collection of tickets to Blossom, that we should go, and more or less forgot about it. Flash forward to last Sunday, when my parents; my sister, her husband, and their family; and I all went to hear these remarkable pieces played by one of the great cellists of the day, outside, as the evening turned into night, and the light turned into dark. I am not a fan of Ma's account of the suites. I do not find them perfunctory, but in the word of someone else, I do find them "bland." He has recorded them three times, and I only know his first recording, which he did when he was quite young. Mstislav Rostropovich, the great Russian cellist--understood by some to be THE cellist of the twentieth century--only waited until he was quite old to attempt them. And people don't like that recording, either, calling it "too reverential." With the suites, you cannot win. I have been to Blossom many times to hear the Cleveland. I heard them play an account of Beethoven's fifth symphony, under Dohnányi, that blew my mind, because it was like hearing it for the first time, and because I wasn't looking forward to hearing *that* overplayed work again. Normally, at Blossom, there are people trying to find each other on the hill leading down to the covered amphitheater--where most people sit, where we usually sit--with children playing, dancing, and calling to each other. It is not what I would call a "riot of activity," but it is a very active space, a very social space. People are largely respectful of what is going on, but they're also not crazy about being respectful. Last Sunday, I have never, ever, been more impressed by an audience's silence and focus during a performance. Ma played six solo cello suites, each with six movements--in his account, a ninety-minute evening--to my astonishment, and my everlasting respect, without intermission. And almost no one made a sound. In fact, it was so quiet on that hill, that when someone did make a sound, you knew exactly where it was coming from, and they never did it again, with the exception of the child, further up from where we were, who visited a small section or roughly half of the suites with an indeterminate wailing, that bothered me not at all. Was it the same child? At the end of the day, all wailing children suffering through a concert they don't understand are the same child. So, yes. I sat, perched on that hill, perched, in almost utter silence, in a sea of people, and listened to these incredible pieces, played for ninety minutes, almost without interruption, and was rapt by all of it. Things accumulated a stillness in this space. A horsefly, or a very large dragonfly, hummed its way over my right shoulder and straight down the hill, several times, over the course of the evening, almost rhythmically, once during every other suite. The clouds were static after a day of rain, and every time I glanced up at them, they had formed only a slightly different position. The light crept away from us, softly, and without incident, and informed the music, as it played, in a single line, from one instrument, by two people, to one person, who was each of us. I. I sat. Perched on that hill of time. A hill that became more steep and less so over the course of ninety minutes. As a horsefly, or a very large dragonfly, kept its time to the music. And a child cried in the distance to a rhythm of Bach, copied out for us by the hand of a wife, buried in a destroyed, unmarked pauper's grave, whose children and step-children, except for one, thought better than to help her after their common father died. I cannot tell you how profound it was for me to share this extraordinary experience with my family. Imagine what it might be like to know something profound--something so beautiful, that you have difficulty speaking about it. Something that, on a very specific level and in a very specific way is core, is central, to who you are and who you have become. Something that is such a sine qua non, you can no longer remember a time when it was not a part of you, because it has backwards formed itself into the time before you knew it. Something you have sat with, and thought about, and listened to, and derived sustenance from, and studied. For thirty-three years. Now, I know. I know my family didn't have the same experience that I did, and how could they? In my mind, to play even one movement from one of the suites would be an accomplishment. To have them hear all of them at once, to have them be confronted by this monumental, marathon work, in one night, without intermission, without ever having heard them before? Unspeakable. And the amazing thing is, though I did not know I had expectations, they did not let me down. Which is really tough to do! I wasn't able to talk to my sister and brother-in-law, but they enjoyed it, and they said so, and I believe them--it's a hard, demanding thing to do, all six suites, without intermission. Even I registered fatigue at certain points. It was my parents--with whom I had traveled to Blossom that night--who spoke volubly, with interest, and with specificity about what they had heard. Is there any better example of why one should be happy that one had the parents one had? Some people have the tools to understand the world without what was given to them. I am not that person. I can only understand the extraordinary world before us with the tools I was given by the people who made me. And while those tools take me places they don't understand, there is always a place that they do. So, I guess, thanks, Mom and Dad. The Baroque suite was considered an old-fashioned form in Bach's time, but the cello was an undiscovered country. Bach, whose patron at the time was a Calvinist who had little use for religious music--Bach's prime form, as a devout Lutheran (a Lutheran who composed Masses, mind you)--put Bach in the odd position of getting paid to do almost whatever he wanted, and so he composed secular music: the suites, the pieces for unaccompanied violin, and others. It is up to the listener to decide if she or he feels these works are truly secular. I hear nothing of the secular about them, and I say this as a proud atheist. Moreover, they partake of a simultaneously old-fashioned sound as well as a thrillingly austere modernism--even, if you like, a postmodernism, in their repetitions and juxtapositions--and yet that austerity gives way to passion and an expressive, deep emotionality. You will be hard-pressed to find a more paradoxical, elusive, moving, or exciting series of pieces called one work. If you are new to the suites, good luck on your new adventure, should you choose to embark on it. If you know the suites well, welcome home. I begin with Yo Yo Ma. What do we find in the prelude to the third suite? A minimal figure that turns at 1:42 into a wonderful floating line that plays until 2:08. It works through the figure, and the recurrent theme of, believe it or not, scales, and a series of false endings, before actually ending at 3:27. That is the third prelude. I call the phrase that begins at 1:42 the money shot. And the suites are full of them. It is the place where I, or you, get grabbed, and a place from which backwards, and/or forwards, you start listening differently. It is the kernel around which the movement seems to be formed, and by which your curiosity draws you into the rest of that movement. It is the piece of sand that around which the pearl is formed. Find it, or them, in each movement, and you will spend the rest of your life listening to the Suites, as I have. Now, we have Mischa Maisky playing the third prelude. Maisky is my Master when it comes to the Cello Suites. I bought his recording while still attending the class I mentioned at the beginning of this post, and he has never let me down. His third prelude is a much more muscular and playful version, to be sure. At 2:04 the money shot begins, considerably later than Ma's version, and can your hear, between the big notes, a song that makes itself known? A descending figure in a song? Wonderful. And listen to how he turns those false endings into a dramatic series that resolve themselves into an ending. The Prelude ends at 4:16. You may, of course, listen to the rest of the entire suite, as you prefer. Heinrich Schiff plays it at a remarkable clip. And then there is the incredible and elegant, the indispensable, Pierre Fournier.